Dyamonde Daniel is excited about the local library's poetry contest, and so is her friend Free. The prize is one hundred dollars -- just think what they could buy with that much money! But when they find out that Damaris, one of their classmates, has been living in a homeless shelter, their ideas about what it means to be rich or poor start to change. And when they get to know Damaris, they realize the one who could use the prize money the most also happens to be the best poet in class. 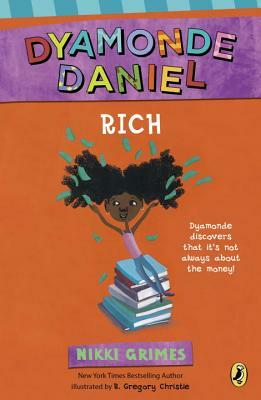 In this fantastic follow-up to Make Way for Dyamonde Daniel, Nikki Grimes tackles big issues like homelessness in a sensitive, kid-friendly way. Dymonde's can-do attitude and lively spirit will endear her to readers.